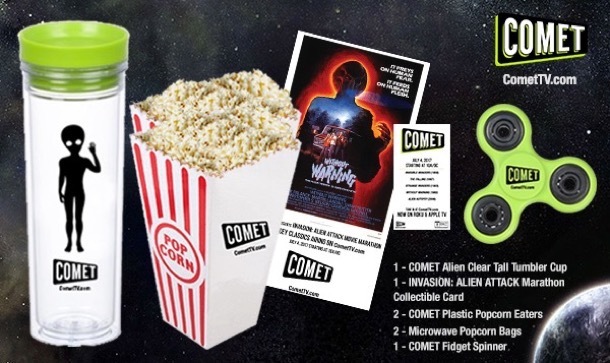 Home / Contests • Featured / Contest Time: Comet TV Alien Attack Movie Marathon Prize Pack! It’s The 70th Anniversary Of Roswell People! Prepare For The Invasion! Contest Time: Comet TV Alien Attack Movie Marathon Prize Pack! It’s The 70th Anniversary Of Roswell People! Prepare For The Invasion! If that wasn’t awesome enough, our friends at Comet TV are giving us a prize pack to giveaway! Sha Wha? I know. 1 – Limited Edition custom designed Fidget Spinner: They are all the rage right now and there’s no better way to cool down when you’re hot under the collar and worried about the survival of the human species! 2 – Comet TV Popcorn Tubs: Munch your cares away with these two custom design popcorn tubs. Perfect to share with a friend or keep all the rations to yourself. You just might need it! 1 – Comet TV Cylinder Survival Bottle: During times of invasion you still need to hydrate. What if you were by a lake or stream while running from the aliens and didn’t have anything to put water in. Breathe freely my friends, we got you covered! 2 – Bags of Popcorn: How can we give you Popcorn Tubs without the popcorn. We’re not evil… Well…. Only sometimes. 1 – Limited Edition Comet TV Alien Invasion Collector Card: Warn your friends about the Alien Invasion with this handy dandy card! Shout it from the rooftops, scream it from the top of your lungs… Or just share it on Facebook. Either way, this limited edition collector card is an awesome way to share the love! Contest Time! Hop To The Music Disney Soundtrack Giveaway! Guardians Of The Galaxy! Zootopia! Star Wars: The Force Awakens! And More! I guess my reaction would depend on their intent. Hopefully they would come in peace, making Earth a part of their galactic vacation stops, where we could also travel to their home. Dash outside with the phone to get video? Go ahead and take a swig off that whiskey bottle we’ve been saving for just such an occasion…I mean, *emergency*..calm the nerves. Take to my cave lair with my family and friends to found an underground civilization until we’re technologically developed enough to take on the aliens. I would probably run somewhere where they have lots of food and water. Nothing! Wait and see what happens! I’d team up with a commando squad and take the aliens down Independence Day style! Hit a costume store, grab an alien mask and pretend I was on the advance team. I would give them a beer! Grab my two boys and jump in the car. Depends if they are nice aliens or not! Go to Walmart, they have weapons and food and drinks! I would kick into survival mode.